And just like THAT - the holidays are over! :) Does anyone else feel this way? I've had some time off, which has been great, but we certainly have kept ourselves busy. We had a blast, but what happened to the last two weeks? Seriously . . . 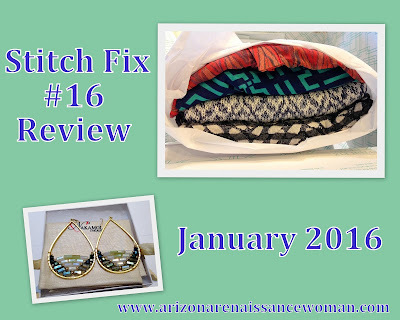 Though I've enjoyed most of my experiences with Stitch Fix, I was not particularly thrilled with my last fix. It just wasn't me, and I also received an item that I felt was very similar to something I had just received! I got a cute necklace out of that one, though, (and left a lot of feedback) and things seem to have worked out much better this time! Obviously, she checked out my blog and my Pinterest board, which I appreciated. If you sign up using my link, I'll get a small credit. Just in case you were wondering, I pay for all my own fixes. My only relationship with Stitch Fix is as a customer. I signed up almost a year ago now and I've really been enjoying it! When I saw a photo of these earring on the Stitch Fix app, (Yes, I peeked!) I felt kind of neutral about them. Cool. Hippie earrings with beads, right? I could be on board. The photo that I saw wasn't quite as detailed as the one above, though. I was pleasantly surprised at how well-made these are. I'm not sure what I was expecting, but these are gorgeous. They're a little bigger than what I usually wear, and heavier than I prefer. To be honest, my first impulse was to send these back. They're so big! If I wear my hair down (as I usually do), I'm just asking for tangle issues. Then I realized that they matched with the cardigan. I thought I'd wear them for a while, "just to see". Yeah. Ha ha. Well, I love them now. I don't think they will be all-day earrings for me, due to their weight, but I can see wearing them for a few hours with the right outfit. They are definitely statement earrings, so they will work perfectly when I don't want to bother with a necklace. They don't need anything else! I had this dress pinned on my Stitch Fix Inspiration Pinterest board. I love the colors! This was so close! It looks all right in the photo, but it was just a bit too snug. It was a little too clingy and it created some bulges in the back that I was NOT excited about! Ha ha. The waist also hit just a tad higher than I would have liked. I usually wear a medium in most Stitch Fix items. I suspect that, sometimes, I'd be better off with a large in a dress. I have big, broad shoulders and a long torso. Well . . . let's be real. I tried on this dress right after the holidays and immediately after a beer and taco lunch with my mom and sisters. I'm sure that didn't help matters. I still think the large would be better, though! cute from the front, but the back takes it up another notch. The black fabric is a little bit sheer, but the placement of the details ensures that bra straps are not visible. That's a plus, especially since I think I could make some great work outfits with this top! This was an easy decision! I have quite a few Skies are Blue tops. It's a great brand. I've received Skies are Blue items from Stitch Fix and also from Golden Tote, another clothing service that I've enjoyed lately. I have to admit - I did peek at what was coming in my fix. I've been on a cardigan/light jacket binge lately, so when I saw I was getting a cardigan, I thought, "Hmmm. Maybe I should change my preferences. I don't need any more cardigans." I was pretty sure I would send it back. That would have been the practical thing to do. Glad you liked your fix! It's always fun to get a 5/5! I got that dress in an earlier fix and love it too! I wore it a couple times and then sold on the boards, love me a rotating wardrobe ;) My January fix will be here tomorrow, can't wait!